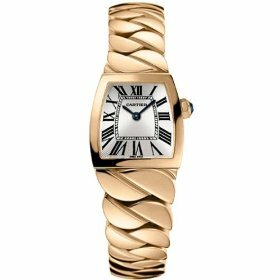 The Cartier La Dona W640030I for women is a stunning and beautiful piece of art that will captivate her heart. The design is flawless, encased in 18k rose gold with a guilloché silver sunray dial and black hands. The Roman numeral hour markers give this timepiece a classic look. As with all Cartier watches the La Dona operates from the exclusive Swiss quartz movement. The face of the timepiece is tightly sealed with a scratch resistant synthetic sapphire crystal that is water resistant up to 30 meters or 100 feet. The wristband is of the Cartier La Dona is very unique, with a twisted ribbon type structure also constructed of 18k rose gold. The deployment buckle is very easy to operate as well as stylish. Women will enjoy this timepiece not only for the gorgeous looks of gold and silver, but also because it is the perfect size at only 22m in diameter. The rose gold has a slight pink hue that creates a richness and luster and glistens at every angle. Currently the Cartier La Dona is available through authorized Cartier jewelers with an average retail price of $26,400.00, although there are prices as low as $21,000.00. This watch is unique, beautiful and everlasting.